You can make dinner very easy by visiting a Sunset Foods store in Illinois. Stores are located in Highland Park, Lake Forest, Libertyville, Long Grove, and Northbrook and have some very easy dinner options. These are some of my favorites. The easiest dinner option at Sunset is their "What's For Dinner" program. On Monday-Friday they have pre-cooked dinners ready to take home. Even better, from 3-6PM each weekday you can sample the featured dinner for that day. They offer a wide variety of dinners which even include dessert. I was in one of their stores recently and they were offering Chicken Marsala, along with Pesto Pasta with Asparagus, a tossed salad with balsamic vinaigrette, bread, and Lemon Bars. You can purchase some, part, or all of these dinners. Just take them home and reheat, very easy! 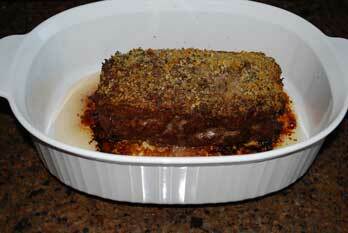 I was amazed to find that Sunset has their own homemade meatloaf on sale for less than a pound of ground beef. It comes in a tin pan with a breadcrumb topping. I choose to transfer the meatloaf into one of my own dishes to bake, and I can tell you no one in my family would have any idea that I didn't prepare this myself. The meatloaf can be paired with some of the great offerings from their deli. 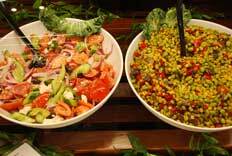 Pictured to the left is their Greek Country Salad and their Roasted Edamame Corn Salad. They also have delicious mashed potatoes and a very popular Kale Salad which would make great side dishes. If you have no time to cook, grabbing some pre-cooked chicken cutlets, steak tenders, or salmon from the deli and pairing it with greens from the salad bar makes for a healthy and quick dinner. The chicken cutlets come in a variety of flavors including lemon, Parmesan, plain grilled, teriyaki, or Grecian. Since I have started shopping at Sunset they seem to be stocking a larger quantity of these cutlets each day, which speaks to the popularity of this item. I have a neighbor who tells me that she gets these cutlets every Tuesday for dinner, her family enjoys them that much. I have gotten the steak tenders myself to serve over salad greens. Top them with a little crumbled blue cheese, and a balsamic dressing and you've got a great dinner. Sunset also offers two types of cooked salmon in their deli; grilled and teriyaki. Both of these would be delicious served over your choice of greens. 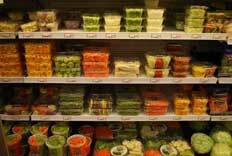 A large salad bar is located near the produce section and offers a wide variety of lettuce and toppings. Prepping veggies can often take longer than cooking them. Sunset has a huge variety of pre-cut veggies that are ready for soups, pasta, or a side dish. They have pre-cut onions, celery, fajita mix, diced sweet potatoes, cubed butternut squash, grill ready veggies that come with skewers and seasoning, and prepped asparagus. An easy easy dinner option would be to saute some of these pre-cut veggies in olive oil, toss them into cooked pasta and top with Parmesan cheese for an easy pasta primavera. These are some of the quick and easy dinner ideas that I have found at Sunset but is not by any means a complete list. The deli and seafood departments in particular have a wide variety of ready to cook or reheat options to make dinner very easy. Disclaimer: I have accepted Sunset Foods as a sponsor of this website because I love the quality of their food as well as their outstanding customer service. I do not earn any profit from sales they receive from visitors of this site but I do accept payment for advertising space from Sunset.